One of my favorite bunshik (Korean "street food") chains is Robot Kimbap. They use 100% brown rice for their kimbap. My friend and go quite often, so we have tried multiple items, so look out for future posts about Robot Kimbap. 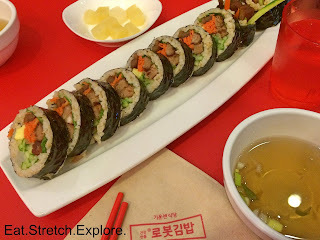 This time we got the ddukgalbi kimbap (떡갈비 김밥) 4000 KRW. If you haven't had ddukgalbi before, I recommend trying it. It's usually a mix of minced pork and beef (or just one of them), marinated in a sweet sauce and then cooked. 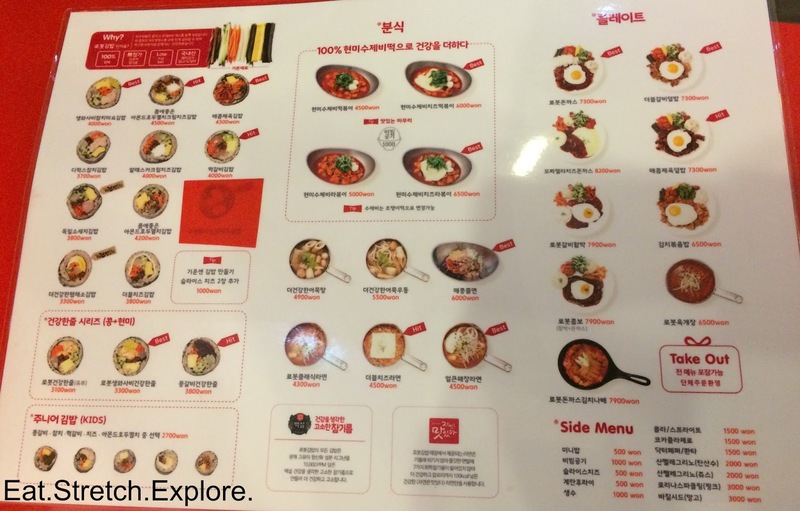 As, I mentioned in the teaser, Robot Kimbap is a premium kimbap place and a "healthy" kimbap place. So, the rolls have many more vegetables and ingredients and are made with brown rice. This wasn't my favorite kimbap option at Robot Kimbap, but it was a nice combination with our other food, the Donkatsu Kimchi Nabe (로봇돈까스김치나베) 7900 KRW. 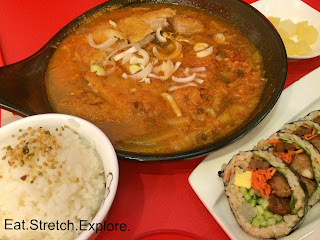 The kimbap was really sweet, which played well with the semi-spiciness of the nabe. Sorry, that the nabe (Japanese for stew) is NOT photogenic at all. This was actually quite nice for a fall day. It's not too spicy, if you're worried about the red color. Nothing much to say about this. It's a very simple dish. The donkatsu (fried pork cutlet) was nice, though. I can see why many people go there for the donkatsu.